Daniel Jones is the CEO of Louisville 21st Century Parks, which he created together with his father, David Jones, the cofounder of Humana, one of the nation's largest health-benefits corporations. The two men launched the organization to implement their vision for a 3,800-acre greenway following the course of Floyd's Fork, a beautiful stream that flows through the southeastern edge of their city. By acquiring parcels of land adjacent to Floyd's Fork and uniting them to form a continuous green corridor, they have found a way to preserve the area's natural beauty and provide a variety of recreational amenities. In implementing the mission of Louisville 21st Century Parks, the Joneses are emulating Frederick Law Olmsted, the designer of Louisville's great nineteenth-century park system. As an outer belt of parkland, the Floyd's Fork Greenway will, like the earlier parks, guide and shape the city's future growth. 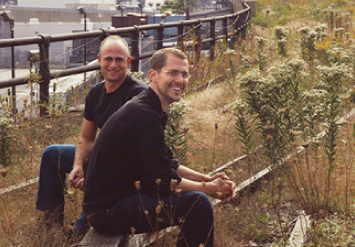 Robert Hammond and Joshua David are the cofounders of the Friends of the High Line, an organization they formed to champion and advance a highly improbable vision: a park thirty feet off the ground on an abandoned, rusting railroad trestle. In order to make their dream a reality, they galvanized the surrounding community, navigated the proposed project through countless public meetings, organized a design competition, gained political support, and proved themselves to be outstanding fundraisers. Today the High Line functions as an aerial promenade with thrilling views of the city and the Hudson River. As a work of landscape architecture, the design of the new park evokes with intelligent sensitivity the elevated tracks' former appearance as postindustrial infrastructure. Instantly popular as a social space, the High Line not only serves its Chelsea neighbors and other New Yorkers but attracts visitors from around the world.